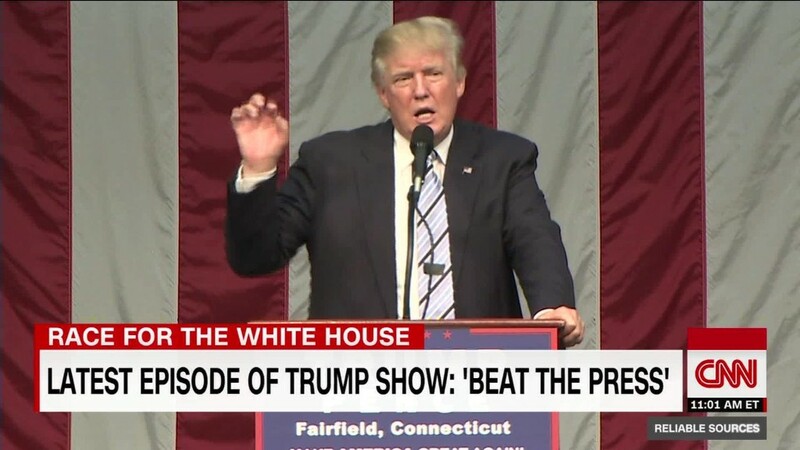 Donald Trump often complains about the media taking his words out of context. 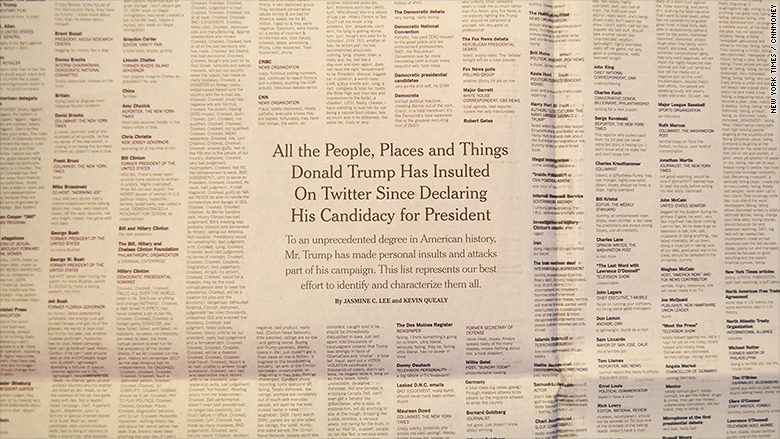 On Monday morning, The New York Times printed about 6,000 of them -- a full two-page spread of all the insults the Republican presidential nominee has slung on Twitter. "SAD!" "CROOKED," "failing," read just a few. The feature included some of Trump's most familiar online grudges, including nearly 6 inches of putdowns he has lobbed at CNN. He's called the network "the worst" and "so negative" since launching his presidential campaign more than a year ago. The spread also recalled explosive feuds Trump had with Fox News host Megyn Kelly and primary opponent Senator Ted Cruz, whom he derided as "Crazy Megyn" and "Lyin' Ted," respectively. The New York Times printed two full pages of Donald Trump's insults. While major media outlets, reporters and other politicians have taken the brunt of Trump's attacks -- many wearing them as a badge of honor -- the Times also highlighted some of the more bizarre enemies Trump has made on social media. For example, he once called musician Neil Young a "total hypocrite" and said Macy's had "no guts no glory." While Monday marked the feature's first appearance in print, the insult tally has a place on the Times website for months and is updated regularly. In a statement, Times Associate Masthead Editor Tom Jolly told CNNMoney that the paper wanted to give the "fullest representation" of Trump's tweets at an "appropriate moment." "The period after the debates seemed like the right time for both parts of that equation," Jolly said. The newspaper has aggressively criticized the candidate this election season. A September editorial bashed Trump's campaign as "marked by bursts of false and outrageous allegations, personal insults, xenophobic nationalism, unapologetic sexism and positions that shift according to his audience and his whims."